Send any files up to 2GB in size. TyphoonUpload allows you to quickly and easily send files to co-workers, friends, and family without the hassle of email attachments or the burden of FTP. Manage email addresses and receive confirmation emails when your files are successfully delivered. TyphoonUpload features full Windows integration and the Express Send option allows users to send files in just a few clicks. Send any files up to 2GB in size without the hassles of attachments or FTP. ...... extra cost.TyphoonDrive creates a virtual drive on your computer that behaves just like your C: drive except files stored here are actually securely uploaded to the cloud. TyphoonBackup provides a convenient way of backing files up to your TyphoonDrive. Send files up to 2GB in size quickly and easily without having to struggle with email attachments or FTP. Send files directly from Windows Explorer! 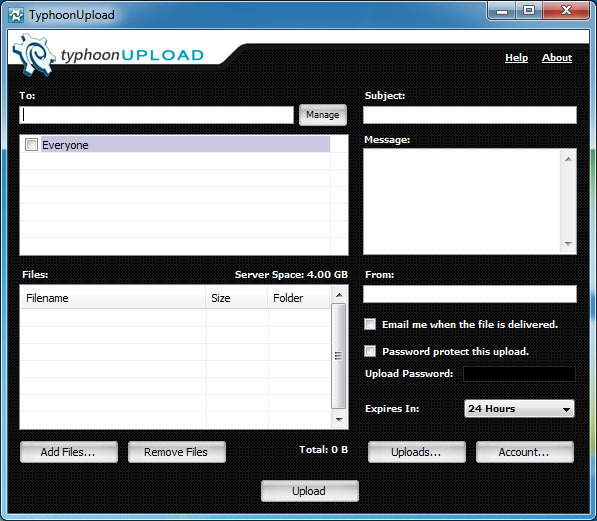 Simply right-click a file and the TyphoonUpload options will be made available. With the Express Send option, TyphoonUpload allows you to send files in as few as three clicks directly from Windows Explorer. No more wondering whether or not your file was received. TyphoonUpload will send you a confirmation email after the recipient successfully downloads your file. Qweas is providing links to TyphoonUpload 2.0001 as a courtesy, and makes no representations regarding TyphoonUpload or any other applications or any information related thereto. Any questions, complaints or claims regarding this application TyphoonUpload 2.0001 must be directed to the appropriate software vendor. You may click the publisher link of TyphoonUpload on the top of this page to get more details about the vendor.